As part of our promotions for this year, we have sent waves (postcards) out to 5 Independent-friendly locations in the heart of (New) Melbourne and each of these locations is a particular type of store. We suggest going up to the counter of likely shops and boldly saying “Shopkeep, please kindly direct me to the postcards that promote Can’t Stop The Serenity in Melbourne!” or similar. It doesn’t have to be the same. You can make it up. Your mission is to travel across time and space (relatively speaking) and locate each of these places. If you can find all 5, enter them into the form below and you could win this awesome prize, thanks to the Doctor Who Club of Australia! 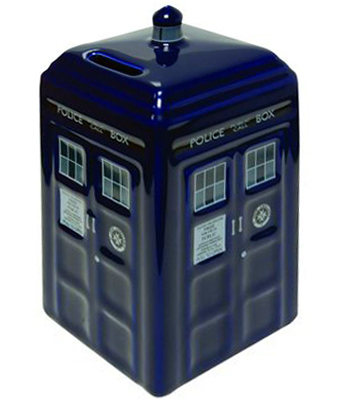 According to the box, you must be at least 8 (eight) years of age to understand the concept of money well enough to enjoy this ceramic TARDIS money box for its intended purpose. Any age can make the noises. Not guaranteed to hold more money on the inside than it apparently will hold from looking at the outside.